A colourfully dressed man wearing an intricate mask is brought near a large flaming altar. Two men guide him with a tightly-wound cloth around his neck. He kicks his legs up in the air, jumps about and quickly collapses to the ground before the cloth around his neck is loosened and he is quickly rushed inside the monastery. At around a height of 100 feet, the Chorten is an intimidating structure to say the least. Every twelve years, the gates of the Gorsem Chorten, a large stupa in Gorsem village near Zemithang, around 90 km from Tawang in Arunachal Pradesh, are opened to the public who can pay their respects to the scriptures and statues kept inside the centuries-old structure. 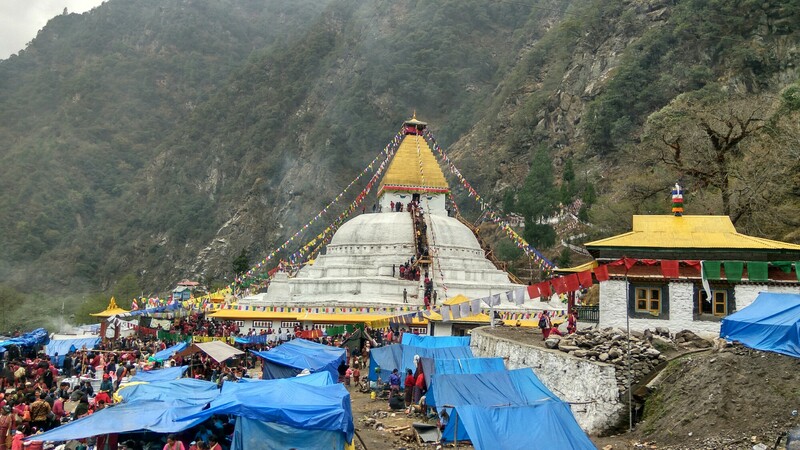 While pilgrims and followers make rounds (kora) of the stupa on a regular basis, it is only every twelve years that the people are actually allowed inside it. This year a special four-day mela was held from March 25 to 28 to mark the event. Considered a major religious site, no written records about its origins exist now. Legend has it that the stupa or chorten was built at around the 12th century by a monk from the area called Lama Pradhar. Monks and locals said that the stupa was built after Lama Pradhar visited Nepal and saw the Swayambhu stupa. Realising that for most people from the Mon region of the state it would be an immensely difficult task to walk across to Kathmandu Valley to make the pilgrimage, Lama Pradhar decided that a replica should be built at its present site. Here is where the story becomes somewhat apocryphal. According to monks and people from Tawang to Zemithang, and indeed the popular version of how things unfolded, is that the monk made a scaled model of the stupa in Nepal by carving out a radish. Unfortunately, that radish became somewhat shrivelled on its journey and hence the slight variations in the size of the replica from that of the original! The stupa in Gorsem also makes up the trinity of similar stupas in Nepal and Bhutan. The oracle draws the excitement of the people as much as he draws their curiosity. Legends and stories aside, the stupa is definitely an impressive and imposing structure. With a large white base, topped off with a golden top, the chorten stands around 100 feet tall. An important event, made evident by the sea of believers that had gathered to gain a glimpse of the inside of the structure, the reason why it opens only once every twelve years depends on who you ask. While some said that it was in the Year of the Rooster as per the Tibetan calendar (which has twelve cycles) that the chorten was completed and hence it’s opened on the same astrological year (such as 2017), there was another reason that was offered. Apparently, the chorten gates (at the top of the structure) were earlier opened regularly. However, frequent thefts of the relics and valuable statues led to their closure and formulation of the twelve-year rule. For the faithful though, the reasons matter little. Thousands upon thousands converged in the small village just kilometres from the Chinese border to climb the top of the chorten to get a 20-second glimpse of the statues and scriptures. The event also presents a business opportunity. 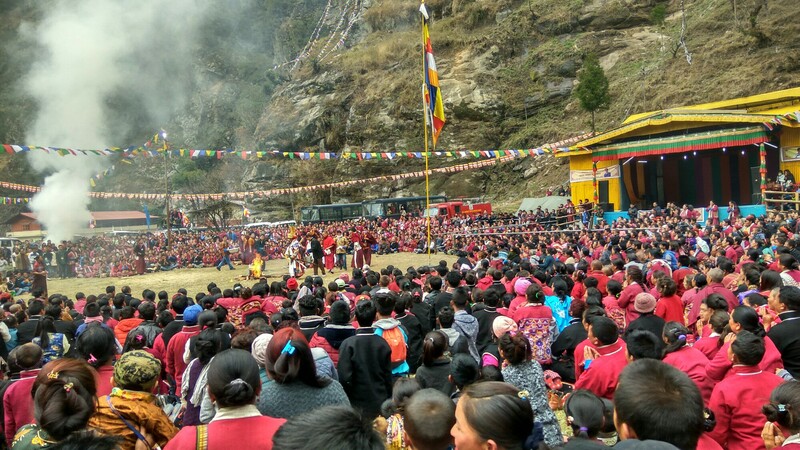 Reportedly, Monpa pilgrims belonging to the same tribe as their Indian cousins turned up from neighbouring Bhutan too, although technically the area is off-limits to foreigners. While pilgrims come to conduct the kora (circling of the structure) and see the inside of the chorten, an important part of the last day is the forecast ceremony that is held towards the end and before the sermon and blessings given by Thegtse Rinpoche of the Nyingma sect of Tibetan Buddhism. A young monk explained to us that the colourfully-dressed masked man happens to be a government official from Bomdila in West Kameng district who acts as an oracle and is able to see the future. People believe that once the oracle is possessed by the spirit of Nyari Gachen (sic), he is able to speak and write in the Tibetan language, thereby able to make predictions about the area and/or reveal important information for the prosperity of the people. The prediction however, is revealed only to the Rinpoche. Zemithang is a small administrative circle at an elevation of over 7,000 feet. 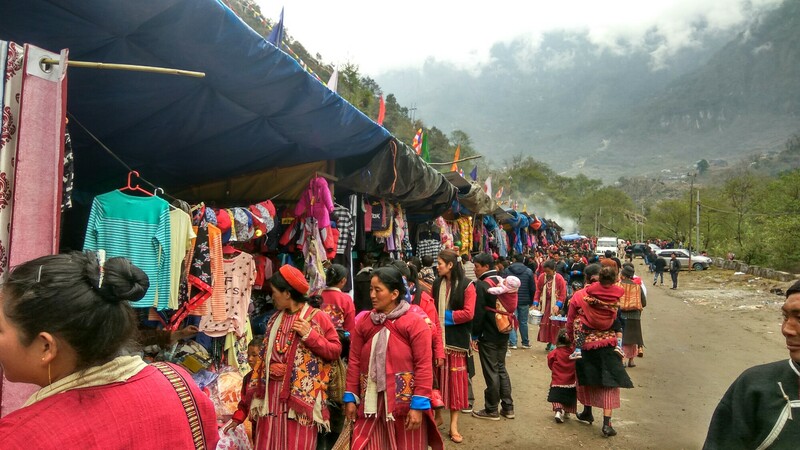 Much like throughout Tawang district, it is home to the Buddhist Monpa people. Its religious importance aside, Zemithang is also one of the only two remaining wintering sites of the vulnerable black-necked crane in the state. The birds are safe for now after the National Green Tribunal last year suspended the Union environment ministry’s clearance granted to the 780 Nyamjang Chhu project in 2012. During such present times when much of the region is trying to balance the demand for modern development with that of the need to preserve the environment, one can only hope that the oracle had good news to share.